It was destroyed by bombs in the war. But now we’re planning to make Train Wood the target of a different kind of blitz. 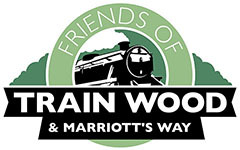 The wood is to be the focus of attention by an army of citizen scientists and experts in nature and railway history later this spring. We’ve teamed up with Norfolk Wildlife Trust to hold a ‘BioBlitz’. Supported by the Heritage Lottery Fund, the event aims to record as many species possible in one day – 27 May – in the 12 acres of the wood. And there will be walks and talks on railway history too, harking back to the days when the site was Norwich’s ‘City Station’. The event will be suitable for all ages and all activities will be free. 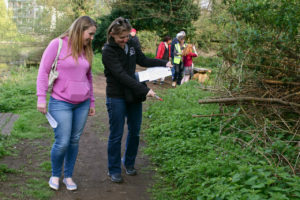 The team met on site this week to plan the set of ‘stations’ where wildlife including plants, birds, trees, mosses and minibeasts will be spotted and recorded. We expect hundreds of people to turn up to help us, by taking tickets and walking the site recording as they go. We’re aiming for at least 300 species, and the day will also feature railway walks and talks by the John Batley and his team at the Friends of Norwich City Station, and pond and river dipping by the Norfolk Rivers Trust. Bat walks, bird walks and tree walks are also planned. The main activities of the Train Wood BioBlitz will run from 11am – 4pm on 27 May 2017, with extra walks and talks planned from dawn till dusk. The latest details of the event will be posted here as it is organised. Do get in touch if you would like to help out on the day! Hi Alison, the meeting point will near the entrance to the Marriott’s Way, near the Barn Road roundabout. You should not have any trouble locating someone if you turn up and walk 100 yards or so up the Marriott’s Way. Thanks for getting in touch. Look forward to seeing you there.